I've always enjoyed watching and reading anything related to Charlie Brown, Snoopy and the crew from Peanuts® when I was growing up and still enjoy them. We had a fabulous time last year when we watched You're a good man, Charlie Brown at the Stratford Shakespeare Festival. If you are a fan or have a fan among friends and family these cute ornaments and decor items for the home and office from Hallmark will make wonderful gifts that bring back good memories. 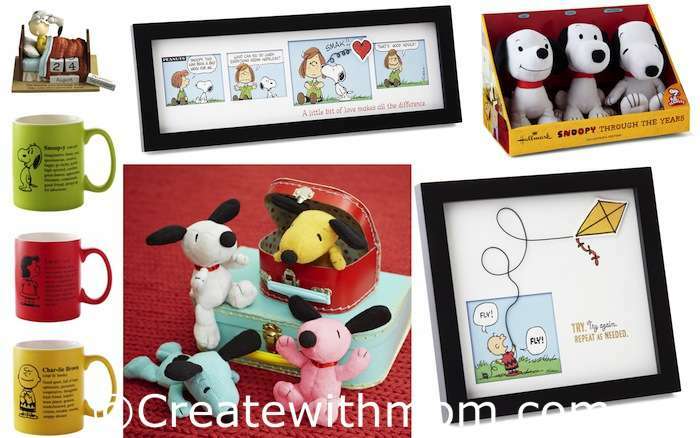 Since its Snoopy's birthday Peanuts® gifts at Hallmark Gold Crown Stores will be buy one get one for 50% off from August 9th to 18th. If you would like to win Snoopy products valued at $50 then enter the rafflecopter giveaway below before September 10th. This giveaway is open to everyone in Canada. Please follow my social media networks and comment to be eligible. Winner will have 48 hours from the time of contact to claim the prize. I loooooove Snoopy and Peanuts ever since I was a little girl! They are soooo funny and just like real life! I grew up with Snoopy. It is a classic comic and so much of it it true. I am in Ontario! If you open up to US I'll pay shipping if I win! My husband loves Snoopy. Live in Ontario and loved watching Snoopy. My favourite character though is Woodstock! I live in Ontario... I've always loved the simplicity of the peanut's cartoons. Woodstock is for sure my favourite! I'm in BC. I use to read the snoopy comics, but didn't watch snoopy until I met my wife. She is probably one of the biggest peanuts fan I've ever met. You should see her childhood room at my inlaws. I'm in BC and I use to read the snoopy comics. I didn't watch snoopy until I met my wife. She's a huge snoopy fan, probably one of the biggest. You should see her childhood room. We are in Ontario - I love Snoopy and Peanuts - especially the Christmas special. I love when Snoopy dances - he is so full of joy! I live in Ontario, love the peanuts gang, and Charlie Brown is my favourite! I live in Nova Scotia. I loved watching Snoopy. I loved watching Snoopy and Peanuts around the holidays. I live in Ontario. I love the Peanuts gang - one of my favourite shows is the Great Pumpkin. My girls love Snoopy & friends too and love seeing them at Canada's Wonderland. I am in NB. I have always loved Peanuts! i am in ontario, i used to watch it when i was younger, i love how it is a classic! I live in Newfoundland, and I love Charlie Brown! I live in Ontario. I loved the peanuts growing up especially snoopy for his fun antics! I'm in BC and I grew up watching Snoopy! I love that snoopy is classic no matter what country you're in. I live in Ontario, and my favourite was always snoopy. I'm not sure why but he was. From NL. Who don't like snoopy. Snoopy is so funny. I live in Ontario and adore Snoopy. So funny and adorable. I am in Ontario. I love Snoopy. Classic! I loved Snoopy as a kid. I am in Canada. I used to watched Snoopy as a kid and found it very funny. I am from Alberta. I used to enjoy watching Snoopy and all the Peanuts in their holiday specials. I liked how there was a lesson to be learned in each story. I live in Alberta. I have always and still enjoy watching the specials. I was a fan of Snoopy and Charlie Brown; also loved Lucy's personality! Definitely a classic. I live in Ontario. I just love Peanuts...especially It's the Great Pumpkin Charlie Brown and the Christmas one! I live in Ontario. I love watching peanuts, I think its because it reminds me of my childhood. I live in Ontario and love watching Peanuts and Snoopy. I like Snoopy because him and Woodstock are so cute together!